How can I add tabs into my web pages? Are you adding all of the code they provide into an HTML widget? And also, are you wanting to make all of your pages like this? I have deleted all the codes from the site now. I plan to add this to all the pages, except homepage, about and contact pages. Also, do you have Yola Silver or Free? Yes, JavScript tags are there. One note- in CSS, I did not insert the code for body since the current CSS already has that. I only added ul#tabs. I have a silver account. You are welcome to go in and look at code, if you can. 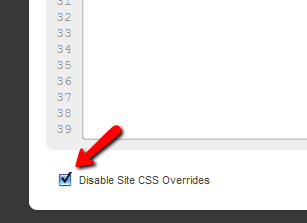 Is the "Disable Site CSS Overrides" check box checked? If it is, that's why the style isn't being added. When you're in the CSS editor, could you try unchecking that and see if that works? I have provided some screenshots below. Thanks! You were spot on. I unchecked the box. You should work for Yola! 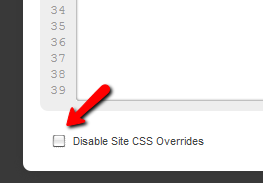 One note- I had to copy the existing CSS and paste it into this area before unchecking the box. Otherwise, the styling went wrong. After that I played with styles to match the general colors. Awesome, glad I could help. :) The tabs look great! Nice work Nathan :) Thanks for helping here!